Dreams of being chased are very common. 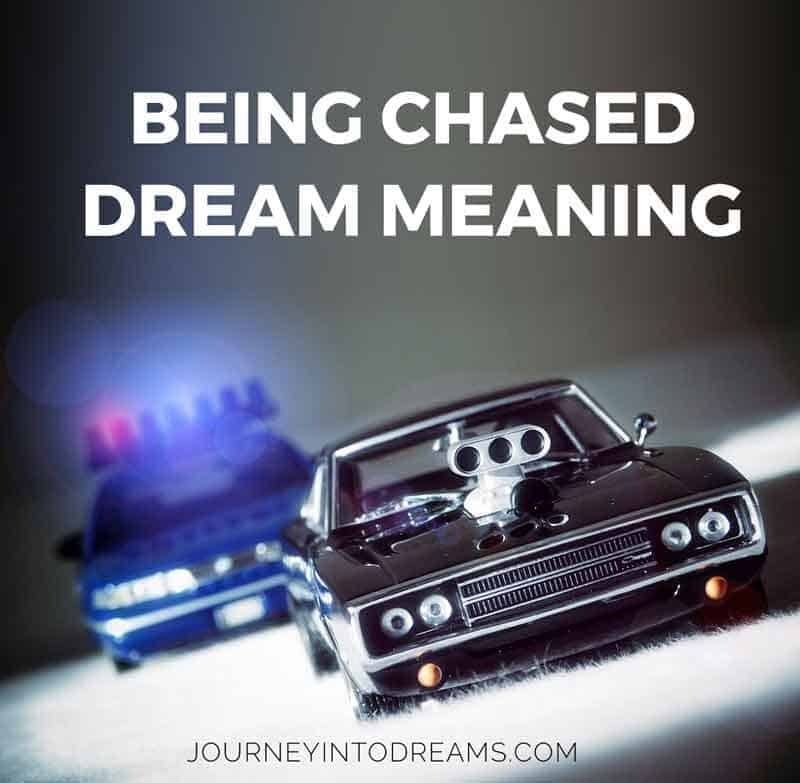 If you are wondering what it means to be chased in a dream or to be chasing after something, there are many ways to interpret this dream and understand the meaning. The history of humans being chased can date back all the way to the earliest of times when humans first began life on this earth. It was a natural survival instinct, especially since during earlier times our ancestors often had very real threats and predators. While it's unlikely you will be hunted by wild animals in our modern life, this survival instinct is very natural, and it has likely stuck with us through evolution. Our dreams of being chased are often a sign of feeling anxiety in our waking lives. We may feel as if someone or something is out to get us - even though the real threat of predators is very minimal in our modern lives. Occasionally these dreams may be literal feelings of fear you may have. For example, if you live in a dangerous area that has high crime rates, you may feel very valid feelings of fear for your own safety. This dream may be manifesting to encourage you to take a self-defense class or even to consider moving to somewhere that is a safer community to live in. There are a number of ways the theme of being chased can manifest in a dream. These dreams can often be very realistic. These types of chase dreams are often some of the most commonly experienced nightmares. Often times we may have dreams where we are running away from an attacker. You may have fears this person chasing after you will hurt or kill you. In these dreams, you are likely trying to find ways to run away and hide from the person or animal. You may even attempt to outwit the attacker. In many cases, this dream means that you are trying to avoid something in your current daily waking life. You may be afraid of something happening, and you are trying to escape dealing with it. If something in your life is causing you fear, stress and confusion, is can sometimes manifest in your dream as an attacker who is coming after you. Sometimes we may have a dream that we are running away from the law or police. It could be possible that this dream would manifest if you have guilt about something, or if you feel like someone else is preventing you from doing what you really want to do in life. It could also be related to your own legal matters in your life. If you are scheduled to go to court or are indeed breaking a law, this dream could manifest as a way of dealing with your own emotions of not following the law. Often times, the attacker in a chase dream is not an outside force but actually manifests as a part of your self. You may be running away from your own feelings or even feeling regret about something you did. You may feel guilt about self destructive behaviors you are doing in your own life. You may also have unresolved feelings about something. Look at the other details of the dreams for more details. For example, if you are being chased in a house, it is most likely that you are indeed running away from some of your own feelings and fears. Often times, these types of dream can be recurring - which means you have the same dream over and over again at different times in your life. When a dream is recurring, you will usually notice similar elements across multiple dreams. For example, they may all take place in the same setting, or the attacker may be the same person. However, the dream does not have to be the exact same in order to be a recurring dream. For example, you may dream of being chased by snakes one night and dream of being chased by a lion the next. The theme of running away from something out of fear is present in both these dreams, and this can give us a lot of clues. Being able to identify what it is you are running away from in real life, and confronting it, is often the best way to stop these dreams and prevent them from happening again. It's also possible in the dream world for you to be the person who is pursuing someone or something else. Maybe you are chasing butterflies - this could mean you are living in the present moment or chasing after flighty thoughts and hopes. It could also mean you are pursuing your goals and aspirations in life. Maybe there is something you want to accomplish. This dream could happen as a way to remind you what would be helpful for you on your path to achieve success. If you are frequently having these dreams, it's important to understand what the dream means. Learning how to interpret your dreams can have many benefits in your life! Who is chasing you in the dream? Is it a person or an animal? Looking up the meaning of different animal symbols can be helpful to better understand the dream interpretation of this dream if you are being chased by an animal. You may also want to look at the characteristics of the attacker. If you are unable to see the attacker, this could mean that you are afraid of the unknown or uncertain outcomes of a situation. If on the other hand you can see that you are running away from a queen, it could mean that you are afraid of stepping into a role of power or leadership. The setting can also give you a lot of clues as to what this dream may mean. When you interpret this dream, try to look at the details of where the dream takes place. Are you being chased on a road while driving a car? The weather and elements can also have some meaning in the dream. For example, are you being chased by a tornado? Or are you being chased through the snow? Maybe you dream you are running away to escape into water - in this case it is very likely you are running away from emotions! All of these things can give us a lot of insight into what the dream means! Have you had a dream where you are being chased? Were you dreaming of someone chasing you and trying to attack you? Tell us about your dream experiences in the comments section below! I dreamed of riding a motor vehicle and was being chased by dogs who’s trying to ask for help/wanted to be rescued. We hit one color black dog, lying on the street and crying.